Chiharu is horrified as she learns that she’s been communicating with Hayate’s terrible father. Hayate learns that his parent’s have been fact finding after learning Hayate was working for an ojousama. As his father sends a text, Hayate realizes that his mom must be the Kanzaki woman, whom he’s never met. With that, he races to the hospital. Meanwhile, Nagi is with the Kanzaki woman who gets the text. She takes off her wig and then confronts Nagi on whether Hayate really confessed his love. Hayate comes into the room and sees his mother. She accuses him of deceiving Nagi in the same manner she is currently doing to Nagi. Hayate denies deceiving Nagi even though he eventually learned she misunderstood him. Hayate’s mother presses her verbal attack, forcing Hayate to concede that he was initially attempting to kidnap Nagi. 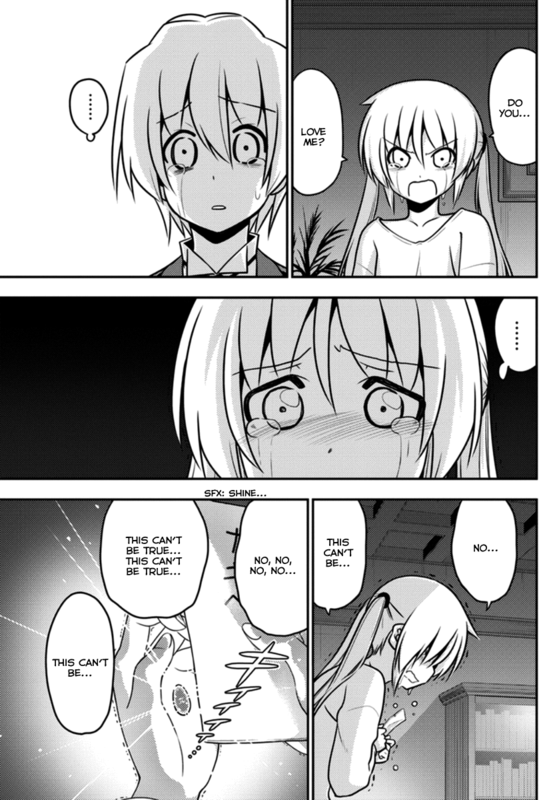 Nagi is crushed to learn that Hayate doesn’t love her and she fees. He snaps at his mother, but she lays the blame for all of this at his feet. Hayate races to the mansion where he finds a crying Nagi crying and holding Maria’s unopened letter. Hayate swears he was trying to protect Nagi, so Nagi asks if he loves her. He does not answer, breaking her heart and causing the King’s Jewel to activate. Even though I’m not a Nagi x Hayate shipper, I like Nagi. I like her a lot as a character. As such, I’ve not been looking forward to having Nagi crushed. That’s what makes Hayate the Combat Butler chapter 561 so hard to read. Remember back in volume 2 when Mikado set the conditions for inheriting the Sanzenin Legacy? If someone made Nagi cry and apologize, he’d pass the inheritance onto that someone. Everything was couched in a gag. And so it wasn’t until the last year or two that I came to realize that Nagi would open up the path to the Royal Garden by crying. And the thing that would make Nagi cry is her learning the truth about Hayate not being in love with her. That has now come to pass. When Gilbert showed up to try to claim the inheritance, Hayate’s thought about Nagi was that should Gilbert succeed, Nagi would end up out on the street and alone, just as he was alone. Further, he felt guilty over owing Nagi ¥150 million. With that, he defeats Gilbert and vows to protect her from those who’d make her cry. Ironically, Hayate couldn’t protect her from one the one person who could make her cry the easiest — himself. Because I had volume 2 at hand to find the passage of Mikado’s inheritance conditions, I went ahead and read the whole thing. I came away with two important things regarding Hayate and Nagi. First, Hayate was determined to not have Nagi suffer as he’d suffered by being thrown out on the street and left to suffer. Imagining Nagi living life all but destitute made him vow to protect her from those who’d make her cry. The other element came from Hayate’s pool game with Maria. Maria attempt to clear up the misunderstanding by suggesting that Hayate marry Nagi. While Hayate isn’t repulsed by the idea, he rejects it for three reasons. First being that he wouldn’t marry Nagi because of his debt. Second being that she’s too young for him. And the final reason is that as someone who’s precious to him and who saved his live from the yakuza, he could never do something so rude to Nagi. That pretty much has set the stage from then on for Hayate’s feelings for Nagi. He cares for her a great deal. He will do anything for her. However, at the end of the day, he’s not romantically in love with her. And that’s what makes things so tragic for Nagi. The initial misunderstanding (and subsequent reinforcement of that misunderstanding) notwithstanding, from Nagi’s perspective, all of Hayate’s actions prove he loves her. From Hayate’s perspective, all of his actions are that of a bondslave, utterly devoted to his master at the cost of his own freedom. We already knew how evil Hayate’s parents were. Hayate’s mom was always portrayed with more hair than she actually has. I know Hata-sensei was trolling us with Kanzaki, but I call BS on having Hayate’s mother magically look identical to Yukariko, simply by wearing a wig. So how does Dr. Kurosu fit into all of this? I can’t imagine that she’s involved in this scheme, but maybe she was. But if she’s been involved, why help Hayate find his brother? I liked the nuttiness of Dr. Kurosu, but if she’s a mole being used to help Hayate’s parents, that will be highly disappointing. Well, time to wrap this up. I still wonder what Maria’s letter says. You have Hisui and Himegami attempting to open a path to the Royal Garden. Presuming Nagi opens it with her explosion of negative emotions, what does that do to Hisui and Himegami? In the end, Hayate the Combat Butler chapter 561 is a depressing chapter in which Nagi gets crushed. I will not surprise if Maria letter turn out not resignation, my buck going for Maria wrote a letter she out to fishing. Haha! That would be a massive troll on the part of Maria if she did that. 😆 I wouldn’t put it past Hata-sensei to have this be the case. Wow, the big villians of the Manga is Hayate. Yikes. That’s for the info. It fits with the feeling I’ve had for a while now. Yeah, I’m wondering about Maria’s letter too. I thought that it would be a simple resignation letter and why she had to leave, but I think now it will be more than just that. Nagi really depended on Maria for support. Maria understood what was happening from both sides. Something had to happen between these two, and wow – what a explosive way to happen, and at least now hopefully everything is now exposed, and the healing can begin. I think there may be words of encouragement from Maria to Nagi in the letter.